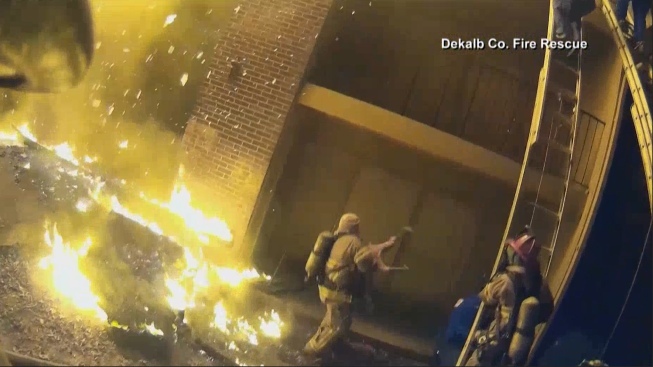 The incredible sight of a Georgia firefighter catching a child and carrying it to safety being thrown from a burning building earlier this month was released on social media Sunday night. More than 45 firefighters battled a big apartment blaze near Atlanta before dawn Jan. 3, saying they had to kick down doors and catch babies to get them safely away from the smoke and flames. The video, released by the firefighters' union, showed a parent climbing down a ladder from a third-floor balcony and dropping the child to a waiting firefighter below. The fire left a dozen people with minor injuries, mostly related to smoke inhalation, said DeKalb County Fire Rescue Capt. Eric Jackson. He identified those hurt as four adults and eight children. Jackson told WSB-TV that firefighters had to smash through doors to help some out. Occupants inside were "literally dropping their children down to our firefighters and we were catching them, and that was before we put any water on the fire," Jackson told reporters. "We had fire burning on one end of the building and residents on the other end didn't have a clue," he told reporters at the scene in an interview posted on the fire department's Instagram page. "So we were doing multiple things. We were catching babies; we were kicking in doors, letting folks know they needed to get out."